While Richard Branson's Virgin Megastores were known for their independent spirit, they were increasingly overwhelming and confusing – the Times Square flagship was 40,000 sq. ft and went beyond just selling records! As Senior Art Director of the newly hired Retail Design and Development team, my goal was to help streamline the customer experience; accommodate a growing lifestyle model and introduce innovative product presentations. This resulted in a comprehensive redesign of the 21 North American store environments. Over the course of 2-1/2 years, our small team developed and managed all Virgin Entertainment Group (VEG) brand identities and graphic standards; created design development packages for a new corporate office in Los Angeles; and implemented a large-scale retail graphics program, which resulted in a +4% incremental sales conversion. The culmination of our store design work was a new top-to-bottom prototype built in Dallas, TX. 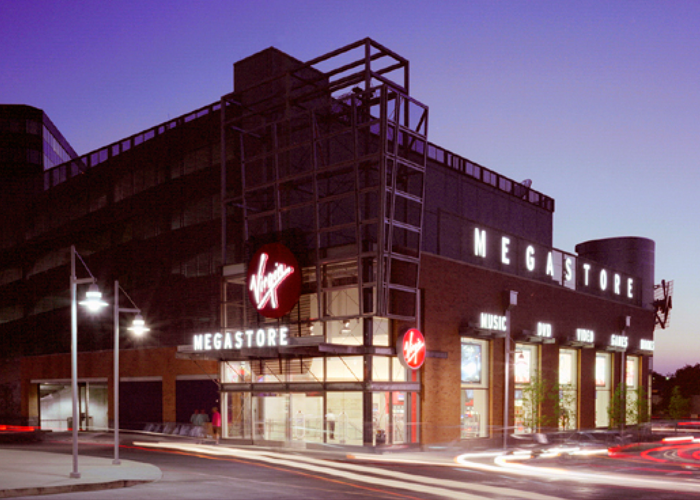 In addition to expanding Virgin's physical presence, we moved to digitize the retailer. We beefed up Virginmega.com, the company's e-commerce website, to enhance brand experience and support strategic partnerships with American Express, Amazon and Microsoft. We also created Virgin's “Megaplay” digital listening kiosk, from concept and information architecture to design and user testing. Implementation throughout the chain led to a sales conversion of +2% and a merit award in How Design Magazine’s 2002 Interactive Design Competition.